Society Hill Playhouse is billed as "...theatre for people who don’t like theatre ... or who think they don’t....". The theater started in 1960 as an "off Boradway" theater for Philadelphia. The century old building houses productions which are casual and fun. Located just a half block south of South Street, Society Hill Playhouse offers two stages -- The Main Stage, located on the second floor, seats 223 -- and the Cabaret Theatre on the first floor, seats 90. The misson of the Playhouse "...perfectly mirrors its history: to present theatre as a social and communicative art, encompassing artistic quality and professional excellence; to provide a place where the artist can develop and grow; to serve all segments of the community, both on a participant level and spectator level; to lay the foundation for individual and community involvement both on a participant and spectator level. 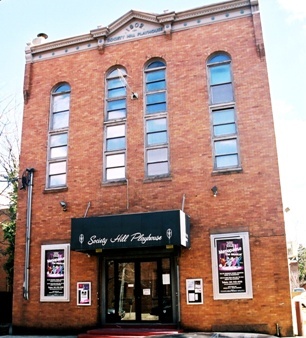 The Society Hill Playhouse is Philadelphia's original public theatre and continues to function as such - making theatre and the theatre experience, as a social, educational, and entertaining event, available to all. ".